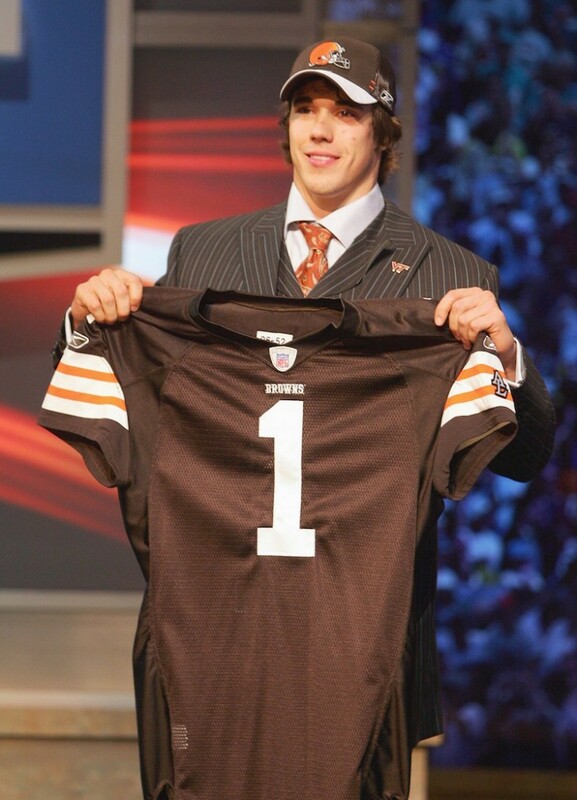 It started in 2007 with Brady Quinn, a strong-armed, can’t-miss prospect out of Notre Dame. It continued in 2012 with a 28-year-old gunslinger out of Oklahoma State named Brandon Weeden. It became a bonafide thing in 2014 with Johnny Manziel, an electrifying, Heisman Trophy-winning, dual-threat quarterback out of Texas A&M. Now you’re probably asking yourself at this point, what exactly is “it”? It, is the indisputable curse on the Cleveland Browns and the quarterbacks that they select with the 22nd overall pick in the NFL Draft. There are really two ways to look at the Browns wildly unsuccessful search for a franchise quarterback. You can either say that the Browns have been searching for a franchise quarterback ever since Bernie Kosar left town in 1993. Your other option would be to look at things from the point of view that because the original Cleveland Browns franchise moved to Baltimore and became the Ravens in 1996, the current Browns have never had a franchise quarterback in their 16-year existence. Either way, the lack of a viable option at quarterback only adds to the long-running misery of Cleveland sports fans. The jury is still out – to a certain extent – on Manziel, but poor play combined with his notoriously immature behavior off the field have the 22-year old in danger of being cut by the Browns after only one season with the team. In fact, if free agent signee Josh McCown can prove to be an adequate game manager, we likely won’t see much of Manziel during the 2015 season. 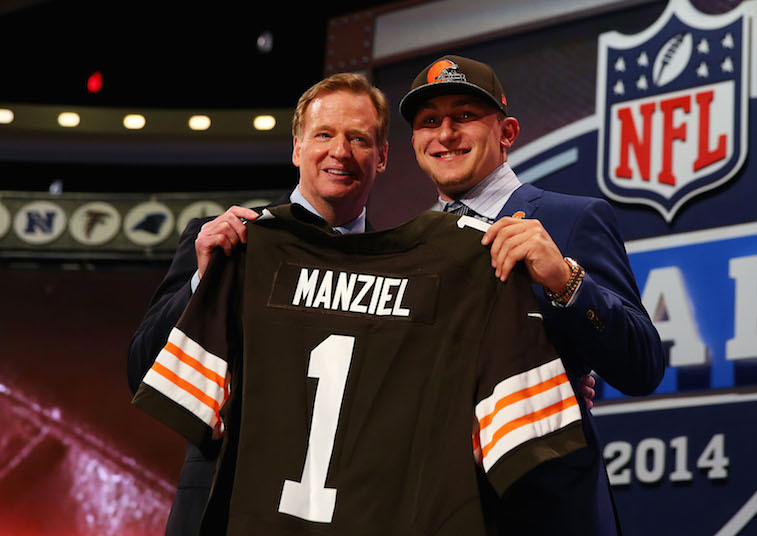 Should the Browns choose to release the 2012 Heisman Trophy winner, they will have gone through three quarterbacks taken 22nd overall in a matter of eight years. Before continuing, let’s take a look at the statistics for all three quarterbacks during their time in Cleveland. As you can see, it’s safe to label Quinn and Weeden busts, and Manziel is well on his way to joining the club. Their statistics don’t lie. The three quarterbacks have produced an 8-26 record in a combined 34 starts. For every touchdown pass they have thrown, they have also thrown 1.2 interceptions. They combined to complete only a hair more than half of their pass attempts with the Browns. They have a combined average quarterback rating of only 60.2. The Browns aren’t the only team to swing and miss on a quarterback with the 22nd overall pick, however. Since 1967, five quarterbacks have been taken in said draft slot – Rex Grossman by the Chicago Bears in 2003, J.P. Losman by the Buffalo Bills in 2004, and the three aforementioned signal callers by the Browns. Of the five, Manziel is the only player who still has a chance to develop into a viable starting quarterback in the NFL. With what we know, would you call this phenomenon the quarterback curse of the 22nd pick, or simply chalk it up to the curse of quarterbacks taken by the Cleveland Browns in the first round of the draft? However you choose to look at it, this much is certain, the Browns need to avoid the 22nd overall pick in the NFL Draft like the Plague.